Between Heaven and Earth describes how the commonality of shared patterns connects people together. The patterns represent various facets of the human experience. Some of these patterns are rendered in a recognizable way, while others are symbolic interpretations. All the patterns are bridged by strong lines illustrating how these elements form a shared, communal bond. 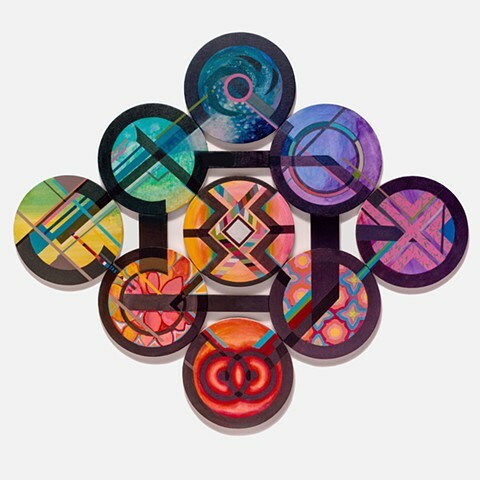 Starting with the top canvas and going clockwise, the canvases represent: Heaven (or the Universe), time, language, culture, marriage or union (bottom panel), Earth, and next two canvases signify lines of communication. The middle canvas symbolizes of the diversity of people by using a multitude of colors that make up lines that are connected and move together. The composition resembles a machine made up of many components and centered by people working together who keep it in motion.